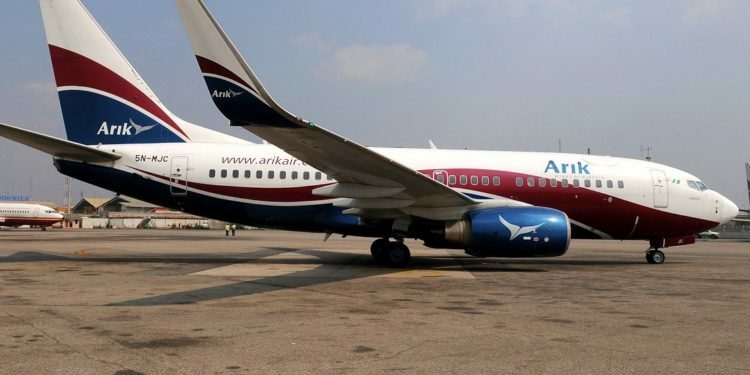 Arik airline has released a statement condemning the attack on one of its managers by angry passengers at the Murtala Mohammed International Airport two days ago. In a statement signed by its Communications Manager, Ola Adebanji, the airline said the verbal and physical attack on its staff and the destruction of some of its properties by frustrated passengers, is unacceptable and will be legally addressed. According to Adebanji, trouble started when the airline’s Lagos-New York flight was rescheduled from Wednesday to Thursday due to the shortage of aviation fuel. The statement reads in part: “On Wednesday, 4 January, 2017, our Lagos-New York JFK service which was to operate at 11:30 pm had to be rescheduled by 24 hours to operate at 11:30 pm on Thursday, 5 January, 2017 due to the shortage in supply of aviation fuel by the major fuel marketers. Our Lagos-Johannesburg service and Lagos- Accra service were also on ground awaiting fuel while the Lagos-New York service was standing by for fuel. Aviation fuel supply has been epileptic in the country over the past weeks where availability of stock and terms of service are not guaranteed on a consistent basis by the marketers. Arik Air pursued all possible options to source fuel for the international flights on 4 January, 2017 but when our Customer Service Manager at the Murtala Muhammed International Airport, Lagos approached the passengers to explain the situation to them, one of the passengers chased and attacked him. This was followed by a mob of passengers who brutally beat, kicked and chased the Arik Air staff throughout the terminal building leading to the Immigration Section of the terminal. The staff was later rushed to the hospital where he was treated for injuries sustained during this reckless and inhuman attack. Arik Air managed to source a small quantity of fuel and despite eventually sorting out the departure of the Johannesburg service, some of the passengers from the affected services damaged the check-in counters, check-in systems and equipment, preventing the airline from being able to service or checking-in passengers on 5 January, 2017. Arik Air strongly condemns the incessant and increasing number of attacks on our staff and property in the recent months. As a flag carrier for Nigeria, the airline expresses it disappointment and dismay that the Aviation Security department (AVSEC) of the Federal Airports Authority of Nigeria (FAAN) and all the other security agencies in the country cannot ensure or guarantee the safety of our personnel when on duty across the various airports in the country. Arik Air will also pursue legal action and engage local and foreign security agencies including private security firms to investigate, identify and prosecute to the full extent of the law all of those passengers in Nigeria and overseas, involved in the attacks against our personnel and property”.